I have to admit, the past week has flown by! I do sit down sometimes and think that this pregnancy is going really slow. But then I think how far I am and how far gone I was when I found out and it has actually gone pretty quick. I can thank the morning school runs for that I think, school hours just fly by. This week has been a little different to my last week. Not a huge difference though. By the way, I did breathe my stomach in my photos, so you could all see Bump better! Couldn't breathe in anymore ha ha. Last week I decided to go back to my local Slimming World group and restart my weight loss journey whilst pregnant. I thought I could try and lower my BMI and make this pregnancy a healthy one. Not eating junk all the time like I did with my other two. I have been put high risk pregnancy and I wrote a post on how I felt being high risk. I do feel disappointed in myself. 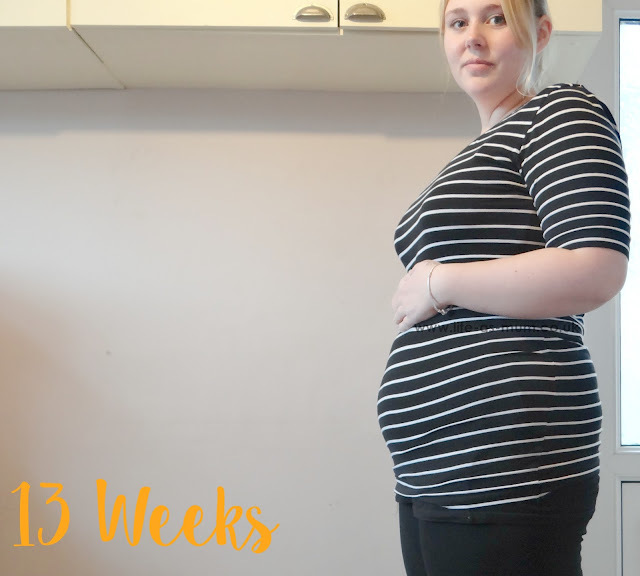 I knew I am a high risk pregnancy near the end due to Obstetric Cholestasis, a liver disorder I get whilst pregnant but luckily the full burst of it hasn't started yet and only get the itch now and then which I can cope with for now. On a plus side, I had my second scan on Monday the 18th. They have now put my Due date forward one day so I am now officially due on 25th July 2016. I will more than likely be induced before then but I am crossing everything that I can hopefully go myself this time, without being induced. We will see! I also had my midwife appointment 2 days after on the Wednesday and got to hear Baby's heartbeat. Baby was pretty low but heartbeat was strong, clear and pretty fast! How are you feeling this week? My hormones have been all over the place this week. I've burst into tears over the smallest and silliest things ever! It's pretty funny looking back but I have also been pretty stressed with personal reasons and worries about my weight and high risk pregnancy. All kinds have been going through my head but I will be fine soon! I have been getting out of breathe a lot recently but I know the reason for it, I think! I've not had much energy recently either, I feel so lazy all the time. Have you felt Baby move? Yes! I have felt Baby move a couple of times this week. Any signs of Obstetric Cholestasis yet? Yep. But only small. I can cope. Any cravings? Not really got any but I have been wanting Cheetos puffs and hot chocolate badly! Congratulations on your pregnancy. 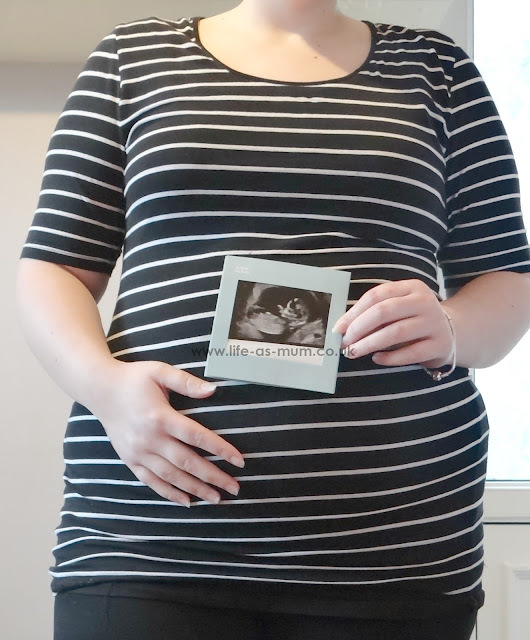 I had to google Obstetric Cholestasis as it is a term I've never come across before, it sounds incredibly uncomfortable and I hope you don't suffer too badly this time. Congratulations on your pregnancy! I love reading bump updates, will be following your progress! I miss being pregnant. Feeling the baby move is awesome. It sounds like you're really making some amazing steps to keep healthy and keep baby safe <3 Congratulations! I hope your pregnancy keeps going well <3 Can't wait for another update! Congrats on your pregnancy! I just had my baby in December, I also did pregnancy updates. Its a great way to document your pregnancy! Congratulations on your pregnancy :) You are glowing, I can't wait to read about your pregnancy and weight loss. Many Congratulations on your pregnancy, enjoy its as much as you can. Congratulations! I dont have children but I remember a friend of mine bursting into tears about everything! Wow! Congrats! You look beautiful! So happy for you! Enjoy every moment of that pregnancy. Congratulations, you are definitely blooming. The hormones are to be expected, well done on going back to slimming world, the time will fly by, and the school runs definitely make it go much quicker, you find yourself counting down to weekends and school holidays! Congrats on your growing bump. Enjoyed reading this post. There's nothing better than making sure you and your baby are healthy! It's awesome that you're doing as much as you can to do that. Congratulations! End of the first trimester! Yay! I can't believe you are already feeling movement! I was 18 weeks before mine. I will be following your updates. Congratulations! I always hated those dreaded hormones. Yay for feeling movement too that was always my favorite part of being pregnant and I miss it still sometimes. Cant wait for the next update! Congratulations, and I hope the OC doesn't get too bad this time. I'd never heard of that before until I read this post. Fingers crossed for you. Congratulations to you. I miss the feeling that i am pregnant and my baby was moving on my tummy if i am hungry or happy. Babies are always a blessing! Congrats! Cheeto puffs and hot chocolate togeter, or separate? Just curious. ;) Everything sounds great! Oh congratulations, what a cute little scan picture. Hope you have a smooth pregnancy and look forward to seeing your little bundle when she/he arrives. Ah I love reading bump updates, huge congrats!! I adored being pregnant and miss it so much!! So exciting! Congrats on the pregnancy!! You look amazing. I remember wanting to crawl into a hole when I was 13 weeks into my pregnancy. lol I was so miserable! Congratulations. Eat healthy food and good luck. Congratulations on your pregnancy. Cheetos puffs and hot chocolate sounds like a yummy snack. Congratulations on your pregnancy, and the best of luck keeping your health in check and lowering your BMI. Here's to a healthy pregnancy and baby! How sweet! Baby on the way! With my daughter I got preeclampsia and I swelled so badly it was hard to tell I was even pregnant. I just looked huge! I think in total I gained 105 lb or so with her. It took over a year to lose all that weight. Although being high risk is obviously pretty scary for you, just think of it in terms of how much more monitored your pregnancy will be. There should hopefully be a bit of reassurance in that, I really hope it all goes well for you hon. Wonderful post and this article give me great information and also tell us about pregnant women thanks for share it Janet Darby .